I like the watercolor pencils too. I can't bring myself to spend the money on copics. They're expensive and it would be an experiment for me. Not sure if I could get into coloring but I'd sure like to give it a try. Thinking about making some more Christmas cards today. I don't want to invest in them either. People color so beautifully with them but...I just keep telling myself my pencils are good enough. Thank you Danielle. Are you making anything today? well it take me awhile sometimes make cards. right now I have lost my mojo on make cards. hmm. I am not good at coloring because my hand shake a lot and it hard for me. most of the time my cards take me longer than a lo. I am so picky about my cards and waste more stuff trying to make them perfect lol. I water color my stamps with distress inks and a very small paint brush. I have watercolor pencils but i have not used them that much. Amy i know what you mean by wanting to change your images. I now have magnolia. lotv, whimsy and one art impressions stamp. I make a lot of my cards for kids so cutsie is alright for me right now. Lisa i hope you get back to creating. I have tried to post something every day. I missed one day so far. but yesterday was hard. i did not feel like making anything. 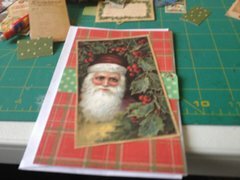 I made one christmas card for a swap and have not even started my own cards. i want to make some thanksgiving cards for my nieces and nephews. i just seem to have more projects then time lately. Lol, I waste a lot too. Hope everyone's mojo comes back soon! nice avi Lisa!! Just don't hand that apple to anyone!! Edited by Kaylann on 10-31-14 08:10 AM. Reason for edit: No reason given. Thanks! 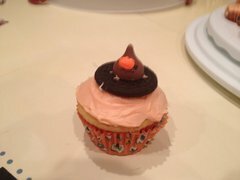 I plan on offering it to every kid that comes to my door. I'm sure not one of them will take it. We'll be waiting for those results! Had a lot of fun last night handing out candy to kids. I love living where we get a ton of trick or treaters. The kids went out with all their friends. well no trick treats this year out here. I don't get many either so I just leave the light out and eat the candy myself. We got about 200 of the little monsters. Lots of fun!! Haven't been making cards this week but I did scrap a page today! Good! I haven't done anything. I did get a few new ink pads though. Hi ladies. I'd love to join your group. I've been a scrapbooker for many, many, many years, and have been "dabbliing" in cards for about a year or so, and that seems to be all I've been doing lately! I think I'm finally getting towards the end of my xmas cards, just a few more!! of course I am working my way out of my "funk" now that the xmas cards are almost done lol. You've been busy, scalvert. Great cards! Hi Anna and Stephanie those are lovely. I need to take a closer look in your Gallery. I made some identical Christmas cards on Saturday. I posted one in my blog if anyone is interested. The challenge was non-traditional colours and I chose white, kraft and pink. I kind of love them! i started some Thanksgiving cards. I realized I have no fall paper. Not a single piece. yea I don't have any fall paper at all. I did some Christmas cards. I think they came okay. I think my cards are not as great as everyone else. You just need a leaf stamp, some cardstock and ink and you can make your own fall paper. 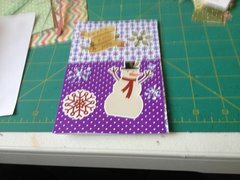 I've been doing a lot of that in my cardmaking these days. I rarely use patterned paper on my cards anymore. Danielle I used to think the same thing about my cards. The good thing about having friends on SB.com is that no one will make fun of your work, they point out the good parts on your cards and with the encouragement and love other people will leave on your cards, your confidence will grow. You make great cards! I have the same issue, I think everyone's work is better than mine, but that's why I love this group. Helps keep us motivated and picks up our confidence. I really wasn't sure about one of the cards I posted but am feeling better about it now. We are too hard on ourselves. I like this group because we all have different styles but it doesn't matter. I love seeing all of your cards. Stephanie! That's the way to go. If your not sure about a card just post it here and you will get all the love you need. Danielle like Amy says we love seeing your work! Don't be afraid of us. I just finished a card for my Mom's dad. Will post pics of it tomorrow hopefully. I also wanted to get some scrapping done but didn't get to it. Maybe tomorrow. I think I've finally completed my Christmas cards. Why, oh why do I want to make more? All the new Christmas lines coming out...dies...stamps....papers, oh my! I just want to buy more and make more. I had so much fun making them this year I never want it to end. hi girls. I took a break for the last few days. I was making something everyday for the challenge on here and just burnt my self out. I got to the point i did not even want to enter my craft room. 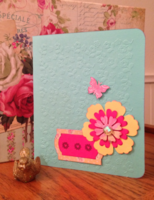 I love the book card on splitcoast stampers. I think i might try and do that card for my Christmas cards. I ordered a fancy pants line that is fall colors. I am not really fond of fall papers and all the leaves and that is why i dont own any lol. Lisa i know what you mean by all the cute christmas stuff. I want to order a bunch of the new magnolia Christmas stamps. what is everyones favorite christmas line this year? I ordered the bo bunny altitude winter line but i have not ordered a new Christmas line yet. last yer i ordered all the fancy pants merry little Christmas line. well i am love all the lines of Christmas. I am really hooked on Lil' Inker Designs Christmas line. Actually I love all their stuff from last year more than the new stuff even. Great dies and sentiment stamps. I have invested more in Christmas supplies this year than I ever have. I try to avoid looking too. Well, I posted a card in my gallery last night. First time using my Big Shot. I will link it here later. Hope everyone is doing well! Good Morning!! Anyone scrapping or making cards today? I made this last night for a friend here on sb.com who just had surgery. Have a great day! Very pretty and colorful Donna! I haven't made a scrapbook page in a long time so I may start one of those today. I've just been on a crazy card kick the last few months. I haven't been scrapping either but I needed a boost so I joined some challenges and so far this month I have made three pages. They're no where near as beautiful as some of the others but I think I will get the hang of it one of these days. I ordered Altitude too! Such pretty colours. I am going to spend some time in my craft corner. I'm not sure yet if I will be making cards or scrapping...anything to get something done. Donna lovely card, so bright and cheerful...that should make their day. I will post some cards that I complete this weekend. I have several birthday cards to work on for a birthday card swap..so I will put the links in here. Your more than welcome! The more the merrier. well I did are Christmas pic now I am put the pic in the cards I made. I started a Christmas card this weekend and then had to order some more Christmas sentiment stamps. All the ones i have are really small and not the look i want for my cards. I think I'm done with Xmas cards! Wrote in them, addressed them and just have to mail them in December! Stephanie I think you need to give me pointers on how to be that early! I have never in my life been this early for addressing Christmas cards. I have a whale of a time getting ONE birthday card out on time much less an entire list of Christmas cards. You are officially my role model! Nice, Stephanie! I keep telling myself I need to think about them (I don't need to make very many) but haven't yet. I have to finish making Christmas cards for myself, my mom and possibly some aunts and grandma. My brother just told me that he wants a missing you card for his girlfriend so I am assuming that is at the top of my list right now. I'm done with Xmas cards! Wrote in them, addressed them and just have to mail them in December! I have them made but still not signed and addressed yet. But this is the earliest I've ever had them done. I even had time to make some to give to a card drive this year to give to nursing homes. I had so much fun, I hate to see it end. 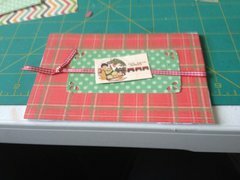 For the first time ever I think I may just make up a bunch of gift tags too. I am done with Christmas cards. now I just need to send them all when I get back for are vacation in Cali and Vegas. I am waiting on my new stamps to get started on my cards. I have been having a break from my craft room. Hahaha it wasn't easy and I don't know how it happened all of a sudden, normally it is down to the wire for me. I got some memento luxe ink pads. I tested them tonight and LOVE them. Great for those solid stamps. Maybe I'll try to make something tomorrow. Amy i dont think i have tried the luxe pads. I have several memento ink pads though. Two of my sentiment stamp sets showed up. Hmmm I will have to try the luxe pads too. I love the momento but starting to get a bit bored with the colors. uhhh oohhhh! I made another xmas card I need to stop lol. I had extra xmas cards that I was going to send to my cousins kids, from Elf/Santa...well I just thought they were too boring and lovely pinterst had to inspire me. Soooo, I made another xmas card and now want to make more. Found this waterfall card on a youtube video and pinterest, cannot take credit for the design.If you pull the bottom piece, the images cascade. Nice! Was that hard to make? Is the Memento Luxe a pigment ink or dye? That's a cute card Stephanie. I know how you feel, I can't seem to stop making Christmas cards either. I ended up donating some because I had more than I needed. I've been having so much fun with them this year. It was actually pretty easy. Just followed the video, but her measurments provided were definitely off, I had to improvise a bit. Hi ladies. I have to laugh at myself -- I joined this group a few weeks ago and forgot to mark it as a favorite! I've been super busy with a couple of craft fairs, but I think I'm just about done. I finished up a basket of handmade cards for my church's Turkey Rama this weekend, and now it's time to start my own Christmas cards! 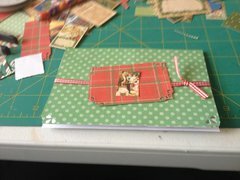 I, too, had put scrapbooking on the back burner as I got caught up in card making, but I went to an all day crop this weekend and completed 6 layouts. It felt good to get some of my pictures scrapped! popping in to say hi. I really need to finish my Christmas cards. I am editing some Holiday photos for my aunt. Hopefully I will get the cards done after that. well I did some more Christmas cards. I need to take pic of them. I was in town today and one of the craft stores has a closing sale. I bought a couple stamps, embossing powder and some paper. Working on some Christmas cards. I still have 13 cards to make. I finally finished a card. You guys have been busy! I haven't done a thing for a couple of weeks. I really need to get on it. Hopefully thanksgiving weekend I'll get a start on things. I take so long making cards I dont know if i will get enough done for Christmas. I spend hours just coloring an image. I only really need to make 5 (I make them the same), and I think I have enough in my stash to cover the rest that I want to send to.